At the Mobile World Congress in Barcelona, Spain Nokia has announced the launch of three new Asha phones. The Asha phones were introduced for the first time at the Nokia World last year and are an alternative to the more expensive smartphones. Unlike most smartphones they also run on Nokia’s Series 40 operating system. The newly announced Asha phones are called 202, 203 and 302 and tend to different market segments. The 202 and 203 Asha models are almost twins and will be the first Series 40 devices to offer EA games. In addition Nokia will be giving away a 75 Euro EA game pack with 40 games for free to customers of either new model. Both models feature a 2.4-inch touchscreen and a regular keypad, a 2-megapixel camera, a built-in music player, FM radio, Nokia Browser, Bluetooth and a SD card slot for expansion with support for SD cards with capacities of up to 32 GB. The 202 model will also come with a Dual SIM Easy Swap technology for all these users who swap SIM cards on the go. The Asha 202 and 203 models will ship in Q2 2012 and will sell for about 60 EUR. 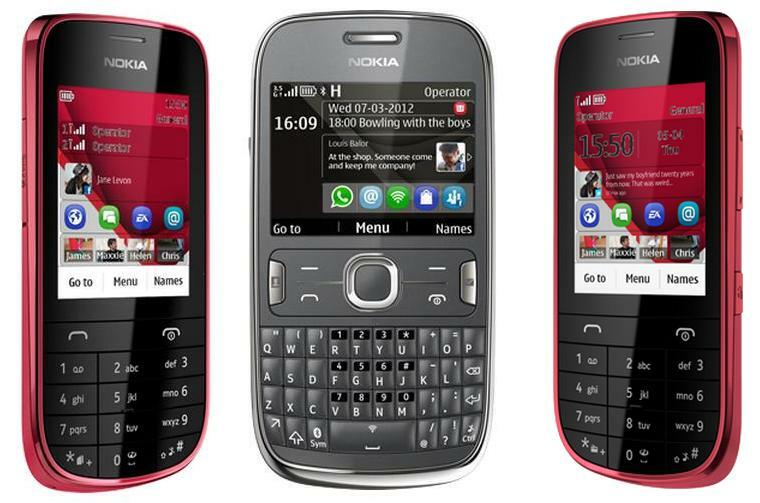 The Nokia Asha 302 will be a bit different from the Asha 202 and 203 models. The 302 will be the first Series 40 phone to support Mail for Exchange. It also features a QWERTY keyboard for fast typing, a 1 GHz processor, 3.5 G data speeds and is available now for around 95 EUR. Nokia did not disclose however if these phones will ever make it to the US.